Version: 3 cabins, 3 bathrooms, 2 kitchens and 1 crew cabin. Autopilot, Gps, Radar, 10kw Generator, air conditioning, air conditioning in the lounge, awning, electric Table for stern sundeck, hydraulic gangway, teak cockpit, teak Deck, Wc with shower, utility room with washing machine and dryer. 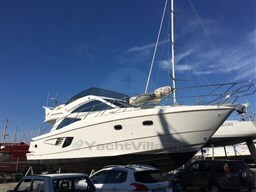 Dear Sirs, I have seen on YachtVillage your offer about Apreamare Apreamare 60 - 2004 (code: 492177). I am interested in the offer and would like you to contact me. Thank you.